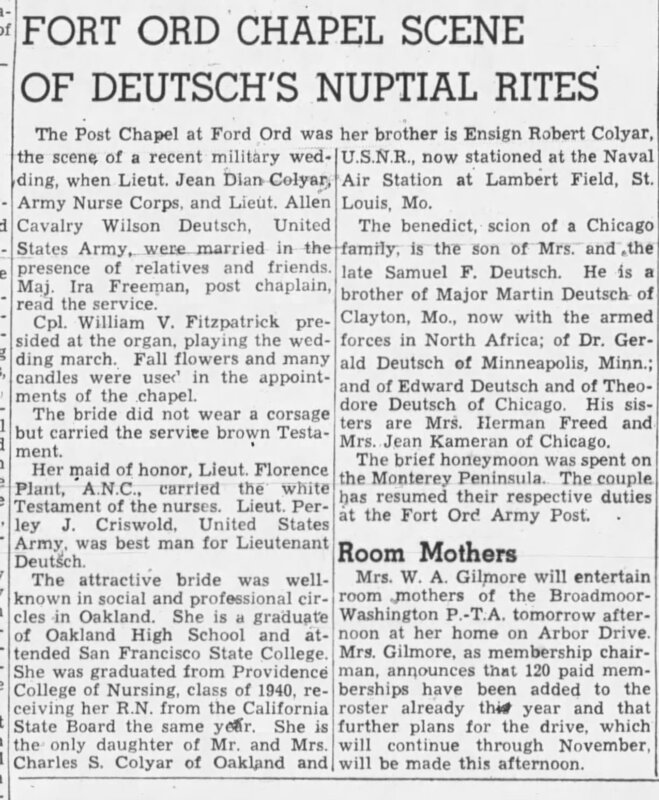 This week I look at a newspaper article on the wedding of a great uncle, Allen Deutsch. The Post Chapel at Fort Ord was the scene of a recent military wedding, when Lieut. Jean Dian Colyar, Army Nurse Corps, and Lieut. Allen Cavalry Wilson Deutsch, United States Army, were married in the presence of relatives and friends. Maj. Ira Freeman, post chaplain, read the service. Cpl. William V. Fitzpatrick presided at the organ, playing the wedding march. Fall flowers and many candles were used in the appointments of the chapel. The bride did not wear a corsage but carried the service brown Testament. Her maid of honor, Lieut. Florence Plant, A.N.C., carried the white Testament of the nurses. Lieut. 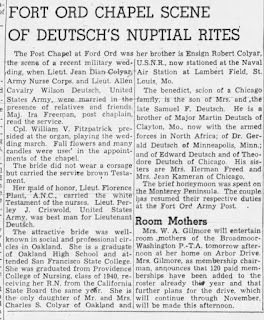 Perley J. Criswold, United States Army, was best man for Lieutenant Deutsch. The attractive bride was well-known in social and professional circles in Oakland. She is a graduate of Oakland High School and attended San Francisco State College. She was graduated from Providence College of Nursing, class of 1940, receiving her R.N. from the California State Board the same year. She is the only daughter of Mr. and Mrs. Charles S. Colyar of Oakland and her brother is Ensign Robert Colyar, U.S.N.R., now stationed at the Naval Air Station at Lambert Field, St. Louis, Mo. The benedict, scion of a Chicago family, is the son of Mrs. And the late Samuel F. Deutsch. He is a brother of Major Martin Deutsch of Clayton, Mo., now with the armed forces in North Africa; of Dr. Gerald Deutsch of Minneapolis, Minn.; and of Edward Deutsch and of Theodore Deutsch of Chicago. His sisters are Mrs. Herman Freed and Mrs. Jean Kameran of Chicago. The brief honeymoon was spent on the Monterey Peninsula. The couple has resumed their respective duties at the Ford Ord Army Post. 1. While the article is filled with wonderful information for a family historian, the most common piece of information one expects to find in a wedding announcement is missing. The date. It's only stated that it was 'recent' and a brief honeymoon of indeterminate length has already occurred. 2. Allen was 29 years old. The term 'benedict' is a reference to the character Benedick from the Shakespeare play, Much Ado About Nothing, and means a newly married long-time bachelor. My grandfather was also 29 when he married my grandmother in 1936.